While speaking of the falsehoods of Modernity, Fr Stephen Freeman once said something to the effect that life is not about the realization of our desires and dreams, but, rather, how we deal with the unchosen circumstances in which we find ourselves. In the ongoing debate over Confederate monuments, these are important words. For if life is not about gaining more and more freedom for oneself for the satisfaction of desires but about dealing simply with ‘what is’, then a lot of the heated rhetoric and actions would die down. How are we to respond when tragedy strikes, when unexpected circumstances, failures or responsibilities keep us from doing and being what we thought God wanted us to do or be? St. Isaac the Syrian in homilies 59 and 60 speaks at length about this. Now if, while a man is walking in the path of righteousness, and is making his way toward God…he encounters in this path some afflictions of this sort, he must not turn aside from his way. Rather, he should accept whatever it is joyously, without scrutiny, and give thanks to God, because God has sent him this gift. That is to say, because he has been deemed worthy to fall into temptation for His sake, and to become a partaker of the sufferings of the prophets and the apostles, and of the rest of the saints who endured tribulations for the sake of God’s path, whether from men, from demons, or from the body. For without the bidding of God it is impossible that tribulations should be permitted to arise; but they occur so as to be for a man the cause of righteousness. Please note that St. Isaac specifically points out that the immediate source of the tribulation does not matter. The man or woman of God receives the difficulty as a gift from God and gives thanks regardless of where the immediate cause seems to be: from man, from demons or from the body. Misunderstandings, false accusations and injustice from people are always a test, always an opportunity for virtue, always a “cause of righteousness” in the man or woman who is following Christ. Even demonic attack—as the Prophet Job reveals to us—is an opportunity either to curse God or to grow in righteousness. This kind of attack also includes the attack of unclean and impure sexual thoughts (heterosexual or homosexual). Some saints, Moses the Ethiopian comes to mind, are glorified specifically because they endured a lifetime of repeated attacks of unclean thoughts without sin. And bodily sickness, either in our own body or in those we love and care for, this too is a gift. It is a gift in that it is an opportunity for the fruit of virtue to manifest, for the Fruit of the Spirit to grow. When I was younger I used to think that only overt persecution for the faith, the actual torture and killing of people who refused to deny Christ, I thought only that produced martyrs. But the hymns of the Church speak often not of martyrs being made by persecution, but of them being revealed that way. In other words, they were martyrs before they died, which is what made them able to die so publicly for Christ’s sake. The suffering for Christ that produces sanctity does not require overt persecution from other people, although that sometimes manifests such sanctity. Whenever we suffer in any way, “from men, from demons or from the body,” as St. Isaac puts it, we are tempted. And how we deal with that temptation makes all of the difference. Do we turn to Christ or deny Christ (perhaps not so much with our words, but by our actions)? Do we continue to love others or begin to blame, accuse and condemn others? Do we thank God for all things, or do we grumble in our hearts? It is a temptation. Every difficult and painful circumstance in our life is a temptation. It is not possible that God should benefit the man who longs to be with Him otherwise than by bringing temptations upon him for the sake of the truth. Further, without a gift from Christ, a man cannot himself become worthy of this greatness—that is, on account of these divine things to enter into temptations and to rejoice. St. Paul also testifies to this. For so great is this, that he plainly calls it a gift that a man should be made ready to suffer for hope in God through faith. Thus he says, ‘Unto you it is given from God, not only to believe on Christ, but also to suffer for His sake.’ And as St. Peter wrote in his epistle, ‘When you suffer for righteousness’ sake blessed are you, seeing that you are become partakers of the sufferings of Christ.’ Therefore, when you are unoppressed, do not rejoice; and when tribulations come upon you, do not be sullen, accounting them as foreign to God’s way. For His path has been trodden from the ages and from all generations by the cross and by death. But how is it with you, that the afflictions on the path seem to you to be off the path? Do you not wish to follow the steps of the saints? Or have you plans for devising some way of your own, and of journeying therein without suffering? And so we too, every time our plans are crushed, our hopes are dashed, our health is attacked and our character is maligned, why don’t we too follow the saints and entrust ourselves to the One who suffered all things for our sakes? Why not turn what is unavoidable into a virtue? Remember, even sinners suffer these things. Why not take the unavoidable suffering of this very broken world and turn it into doxology, into thanksgiving, into trust in the God who raises the dead? This is the gift St. Isaac is talking about, the gift to turn death into resurrection, the gift to turn earth into heaven. What does all this mean for us? Slavery, oppression, discrimination, and any other evil done to us and the memory of them should not be turned into opportunities for vengeance, sadness, confusion, etc. but for giving thanks to God because through these sufferings we are saved; true freedom is not political or economic liberty but freedom from evil passions; men and women are not truly human until they deny themselves completely for the sake of others, even those who mistreat us, as Christ Jesus did. He was the servant of the Great Martyr Demetrius, and was present at his martyrdom. He dipped the hem of his garment in the martyr's blood, and later worked many miracles with the garment, healing many illnesses. At the order of the Emperor Maximian, he was then himself arrested, tortured and, like his earthly master, beheaded for Christ. It is said that, as his death approached, he prayed to be baptized before his death, for, though a believer in Christ, he had never been able to be baptized. A cloud suddenly poured down a torrent of water upon him, answering his prayer. She is called "Nino" in many accounts. 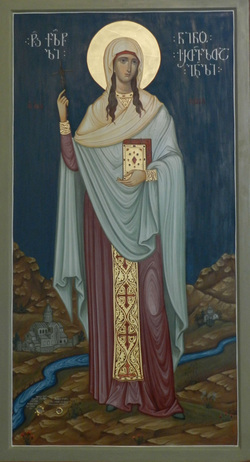 This holy maiden was a Cappadocian, the only daughter of Zabullon, a kinsman of the Great Martyr George. She was captured and enslaved by the Iberians (later called the Georgians) and taken away to their homeland. In captivity, she lived a sober and pious life, devoting every free moment day and night to prayer. Her exceptional virtue attracted the attention of many, especially those hungry for Truth, and she simply and boldly proclaimed the Gospel to all who inquired of her. Once she healed a woman's sick child by her prayers, and the report of this wonder reached the Queen of Georgia, who was herself suffering from an incurable disease. She asked the slave to come to her, but Nina refused out of humility, so the Queen had her servants take her to Nina's dwelling. The Saint prayed and the Queen was healed instantly. Returning home in joy, the Queen praised Nina and her faith to the King, whose name was Mirian. The king payed her little heed, but later, while hunting, he was suddenly engulfed by a dark cloud, so that he lost his way and was stricken by fear. Remembering his wife's report, he prayed "to the god whom Nina worships," and vowed that if he were delivered he would worship Him alone. Immediately the cloud vanished and the King received the light of faith. Hastening home, he found Nina and, King though he was, cast himself at the feet of the slave and told her that he had resolved that he and his whole nation should be baptized. He sent emissaries to Constantine the Great, who quickly dispatched bishops and priests to the barbarian kingdom. When the conversion of the country was well under way, Nina, though now freed, determined to stay in Georgia, where she withdrew to the wilderness and prayed fervently that the people would be confirmed in the Faith of Christ. Saint Nina reposed in peace, surrounded by the King, his court and the clergy. Thus did a powerless slave woman, by the power of God, convert an entire nation. All the shouting and fighting and vandalizing by the social justice warriors for the sake of their supposed rights and rectifying past evils is nothing but ashes in the light of saints like St Nina. By their standards she should have cursed the King and Queen of Georgia and their whole nation. She should have prayed that the whole land be swallowed up by the earth. But, because she had real love for God and man, she blessed them instead. How much good could these protesters do if they followed St Nina’s ensample instead of the ways of the demons? How peaceful would the West be if it would reject the worldly utopianism of the American Dream, the socialist paradise, etc. for the liturgical and sacramental life of the Orthodox Church of her forefathers, the fulness of which these others are but a pale shadow? Life is not about satisfying one’s desires. It is about being a slave to Christ: willingly and joyfully denying oneself and carrying the crosses He has given us to carry. That is true freedom. Corporations across the political spectrum have taken an outsize role in identity formation, functioning the way, say, a church service or other ritualistic gathering once did. A well-meaning left-wing college student might choose to spend her money on companies whose values align with her own, choosing to buy her sandwich from Starbucks (or, more likely, an independently-run, sustainable, fair-trade equivalent) instead of Chick Fil-A. But every time she goes there, or tweets her support of this or that brand, she reinforces her own identity, both to herself and others, as a member of a group with particular and specific values. So, too, the right-wing “free speech” activist, who may choose to patronize censorship-free platforms like the chat application Discord, or use, as the Daily Stormer did, hosting platforms like Cloudflare. Critics of either set of behaviors might dismiss either set of spending choices as “virtue-signaling”: the process of performing “good” behavior to achieve a higher status within a given targeted group. But, in practice, the reinforcement the company provides — demanding the spending of money as a ritualistic as well as transactional act, fostering communal interactions with its fans on social media — is less unilateral. It’s not just virtue-signaling, but virtue-creating. In this, corporate identity functions as a kind of religion, at least in the sense understood by 19th century French social scientist Émile Durkheim, who envisioned religion’s function ultimately as a kind of social glue fostered through the affirmation of one’s own identity, in which people "feel bound to one another because of their common beliefs.” Consumption, in other words, has replaced community. In such a paradigm, where corporations and “branding” mediate our own sense of self and contribute to the affirmation of our values, is it really such a surprise that they have also become, more than ever, self-proclaimed arbiters of the public good? In an increasingly fragmented society, where the largest “religious” group in America is the religiously “unaffiliated,” where even religious faith is increasingly decentralized, corporations have become the closest thing many people have to religious bodies. For all of the power of the Christian right as an umbrella movement, we no longer have a unifying cultural body like, say, mainline Protestantism was a century ago. Our own consumerism and corporate loyalty is the closest thing some see as a way of expressing faith. It’s difficult to say whether that’s necessarily a good or a bad thing. It is as much a result of wider cultural forces than its cause — no more or less than KLM’s decision to run a pro-LGBTQ ad or Google’s choice to fire a sexist employee. But it’s worth comparing Airbnb, Google, or any other corporation whose stated morality can easily change with what’s trending on Twitter, with its polar opposite in terms of approach to public opinion: the Catholic Church, a body that has, by and large, steadfastly resisted altering its doctrines to reflect a given cultural mood, even when many of its members might like it to. Both sets of institutions — and both approaches to morality — have their pros and cons. But, when it comes to conflating corporations’ business decisions with their moral stances, we cannot afford to overlook the extent to which they reflect, and reinforce, capitalism as a major religious, as well as economic, force in American society. We affirm our values — and identity — at the shopping till as much as, or more than, the altar. The CEO-pastor and oversized-business-corporation-as-Church are the latest gifts to the South and the other States from New England ideology. But, fresh off caving to corporate threats in North Carolina and Texas over something as morally uncomplicated as who belongs in what bathroom, does the South have the will to withstand this latest large-scale attack on Christian tradition by the neo-Puritan corporate oligarchy of ‘self-proclaimed arbiters of the public good’? Or will Southerners quietly and unthinkingly complete their transition to homo economicus?